Players represent the general population of either Salem Town (modern-day Salem, MA) or Salem Village (modern-day Danvers, MA). In a two-player game, there is one player representing each. In a three player game, there is a second Salem Village player (with slightly different Victory Point bonuses). In a four-player game, there are two players of each. The VP balance between players feels weird but is still balanced. There are three prominent families historically associated with the region and the trials: the Proctors, Porters, and Putnams, all of whom are the focus of Victory Points in the game. Both Salem Village players gain +2 VP for every Putnam family member they bring into their Circle of influence. Both Salem Town players get +2 VP for every Putnam they arrest. One Village player will get VP for arresting Proctors, while the other gets them for arresting Porters. Conversely, the Town players get VP for having Proctors or Porters in their Circle. 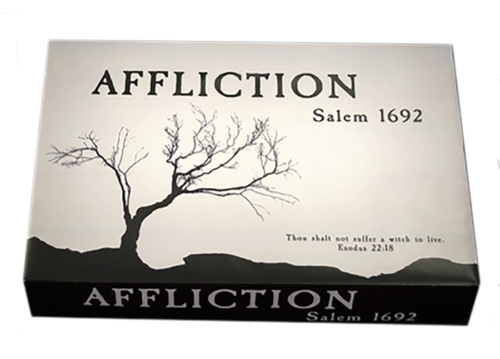 To take actions, players take turns placing Puritan shaped meeple onto The Esteemed action board. These actions represent those taken by various Esteemed members of society at the time, such as Governor Willaim Phips (who can Exonerate colonists, by removing Accusation tokens) and Reverand Cotton Mather (who can add Fear and/or Accusation tokens). As colonists are recruited or arrested they are replaced by further Colonists or Prominent Colonists until Reverand Increase Mather or the Governer’s wife, Mary Spencer Hill, are revealed to end the game. There are a few categories of Victory Points to be earned, but that’s probably the most complex part of things. In general, the game is fairly straightforward, and that’s not a bad thing. Even with so many potential actions available, and points to be scored, it doesn’t take long to catch on which can be a challenge for games like this. I enjoyed the art style on this. Where relevant, the simple ink lined portraits are historically accurate representations of the people in them. Even if you don’t actively look that up, you can intrinsically just tell. The plastic box insert keeps all the tokens and such well organized when playing, but I’ll have to wait and see if the extra space causes issues when traveling. In a case of “real life is more terrifying than fiction” this game isn’t just fun, but can be the impetus for learning about a terrible event that is often only known by reputation. You should take advantage of both things.